Give Something Back International is a non-profit foundation providing life-changing educational opportunities for children worldwide, founded on the belief that early education can make a positive difference in the direction of a child’s life. 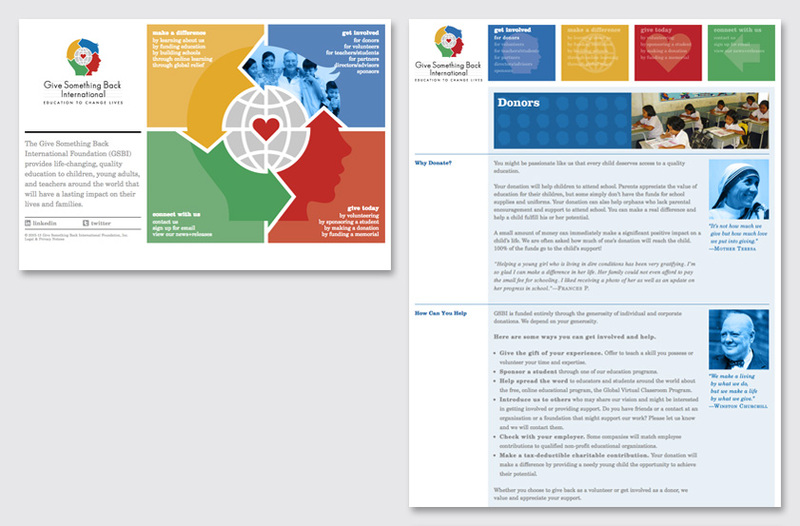 Our homepage uses the foundation’s logo to create a unique navigational interface, displaying four images that define the scope of the organization. The images cycle in the direction of the arrows as a metaphor for giving back. The four quadrants enable the user to roll over and click on the text to jump to the appropriate page. Self-identifying categories use active phrases to inspire viewers to take action in support of the foundation’s mission. 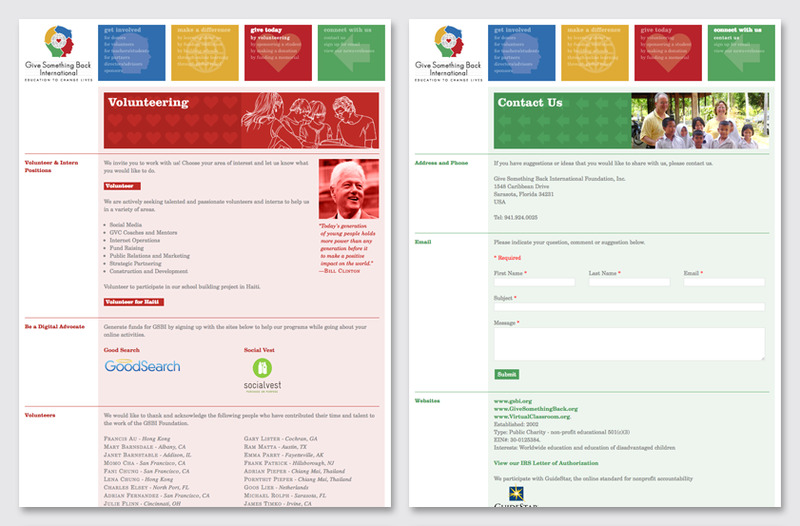 On interior pages, each category is differentiated by its own primary color, symbol, and background pattern. To incorporate interactivity on each page, each header enables the viewer to roll over the line drawing to reveal a photographic image, symbolic of the foundation’s ability to create a “blueprint” for a child’s educational progress and growth. Inspirational quotes from historical figures are color-coded to each section throughout the site, providing a sense of context to the organization’s objectives. A “Donate” or “Volunteer” button identifies the call-to-action. 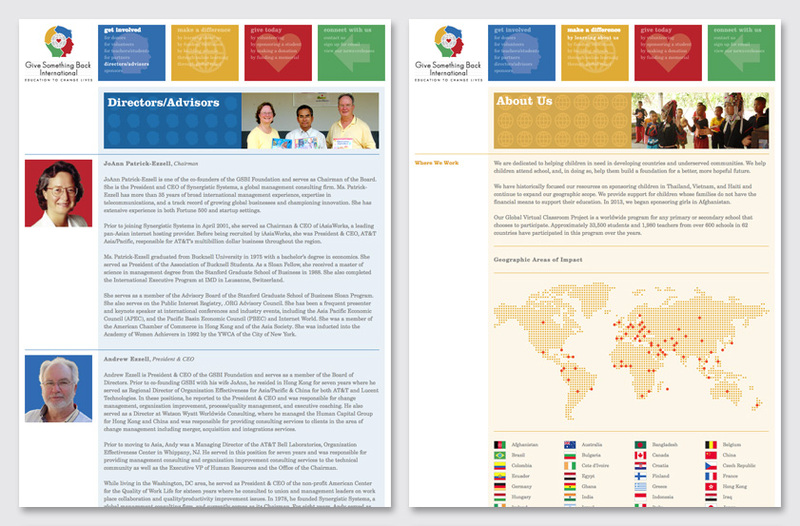 In the “About Us” section, a world map and country flags define the breadth and depth of the foundation’s international impact.